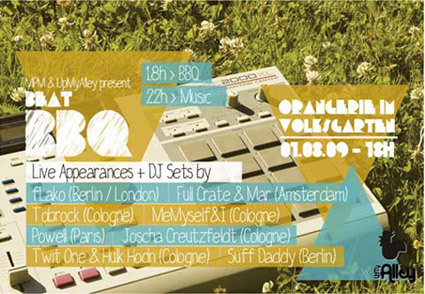 Because Melting Pot Music throw a party and invite some artists to play live at the Orangerie in Colognes Volksgarten. The following names will deliver some Hip Hop, Soul and Funk rhythms: fLako, Twite One & Hulk Hodn, Suff Daddy, Powell, Full Crate & Mar, Tobrock, MeMyselfAndI and Joscha Creutzfeldt. So feel welcome to drop in to this intimate barbecue, where also an exclusive pre-sale will introduce the new Hi-Hat Club Vol. 2 – Suff Draft.